ARCATA – In admiration of outstanding valor during the line of duty, the Arcata Chamber of Commerce will be celebrating Detective Sergeant Todd Dokweiler and Officer Brian Hoffman of the Arcata Police Department at an Open House on Wednesday, July 27, 2011 from noon to 1:15 p.m. at the Arcata Chamber of Commerce’s California Welcome Center. 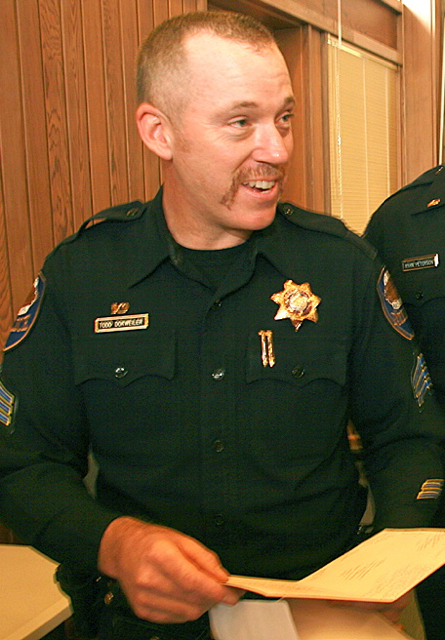 Both Dokweiler and Hoffman will be presented with plaques from the Arcata Chamber of Commerce membership in appreciation for quick thinking and bravery in the line of duty. On February 2, 2011 at 2:25 a.m. Sergeant Todd Dokweiler saw a fire at the base of the two-story Tea Gardens Apartments complex. Sergeant Dokweiler notified the Fire Department and activated his siren to awaken residents. Within moments the complex was fully engulfed. Two female HSU students exited the rear of their second story apartment and were standing on the balcony with no way down. As flames began pouring out of the apartment behind then Sergeant Dokweiler was able to stand on a nearby retaining wall and reach the bottom of the second story balcony. The two HSU students climbed over the railing and were able to use Sergeant Dokweiler’s body as a ladder to climb to safety. 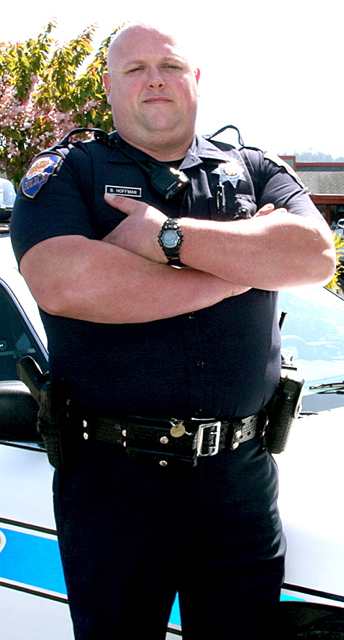 On July 8, 2011 at about 11:45 a.m., officers from the Arcata Police Department responded to the 900 block of Sixth Street on the report of an adult male subject pouring gasoline on himself and a building. The male had a lighter and was attempting to ignite the fuel. Due to the immediate risk of severe injury or death to the male subject as well as a significant fire danger to the adjacent buildings, Officer Brian Hoffman sprang into action. Without regard for his own personnel safety, Officer Hoffman quietly approached the male subject while other officers distracted him. Once Officer Hoffman was within range, he single-handedly disarmed the male of his lighter and detained him without injury to himself or the male subject. This entry was posted on Tuesday, July 12th, 2011 at 3:49 pm	and is filed under News. You can follow any responses to this entry through the RSS 2.0 feed.